I was rather surprised but pleased to see that my "Black Back Security Review" was on the list of the "Top Ten IT Conversations Shows for March 2008". My "surprise" was mostly because that particular talk is over a year old and was given at the ETel 2007 show back at the end of February 2007. To be honest, I was not actually aware (or didn't remember, anyway) that the IT Conversations Network had distributed my talk but I'm guessing they did so with a number of the ETel sessions. Anyway, it's cool to see people discovering that session again. Nice surprise! Over on Blue Box, I uploaded on Friday what I consider one of the best overviews about SIP security that we've done: Blue Box Special Edition #20. I recorded the interview out at VoiceCon San Francisco in August and it's with Cullen Jennings who is a Distinguished Engineer at Cisco Systems, but more relevant to SIP is one of the Area Directors for the Real-time Applications and Infrastructure (RAI) area within the IETF. Basically all of the proposals for RFCs relating to SIP roll up under the RAI area. Cullen's also quite interested in and knowledgeable about security and in fact several of the security-related RFCs related to SIP include Cullen as one of the authors (as do a number of the current proposed Internet-Drafts). So he knows his stuff... and being a frequent presenter, he's also good at distilling complex things down into more simple descriptions, so it was an enjoyable interview that I think you will also find quite educational. If you're working with SIP, or considering it, I'd highly recommend you listen to the show. I posted Blue Box Podcast #56 tonight and with it Jonathan and I are beginning a series of mini-tutorials on subjects related to VoIP security. In this show, we talked about voice encryption. In the next show (already recorded) we will talk about signaling encryption. The idea is to cover some basic ground so that people not familiar with the area can have a basic understanding. Today starts the first day of ETel, a.k.a. O'Reilly's Emerging Telephony conference. ETel is not one of the giant conferences... unlike one of the VONs, Internet Telephony or VoiceCon there will probably only be 500-1000 people here. But that is part of the charm, really (and this is only the second year)... it's a place for the VoIP alpha-geeks to network, promote their visions, combine their visions, socialize and otherwise just learn a heck of a lot from each other. The schedule is packed with great info... the speaker roster is a veritable "Who's Who" of people playing in the "Voice 2.0" or "Telephony 2.0" (or <pick your cliche term>) space. All in all, it's one conference I've been very much looking forward to. Just in town last night, I've already run into Alec Saunders, Brad Templeton, Bruce Stewart, Surj Patel... had dinner with Blue Box podcast co-host Jonathan Zar and security researcher Shawn Merdinger... I know Ken Camp is around, Andy Abramson, Om Malik and so many others... it should be a great and fun conference. One of the things the three of us will also be doing is talking about a list of VoIP security tools that VOIPSA has been developing... stay tuned for more on that. Then on Thursday I have my "general session"... my "15 minutes of fame" (or infamy) from 11-11:15am in front of the entired assembled crowd... where I will attempt to digest into that brief time the salient points about VoIP security. I am actually VERY much looking forward to this session because I've done my presentation in a completely different style from any other presentation that I've given publicly. I'm going to tell a story... and do so in a way that should be both fun and entertaining... and will also get the points across. I'll say little else... except perhaps to dangle the tease that it comes in at over 200 slides yet clocks in at only about 11 minutes right now. (have to leave time for questions, eh?) Like I said, completely different style from other presos I've given... but I'm very much looking forward to it. Fans of Blue Box have to be aware that I'm a wee bit behind in posting episodes... so I was delighted to finally get Blue Box #50 uploaded yesterday. I still need to finish putting the show notes up there, but at least the show is out so that people can listen to it. Given that we recorded it January 17th, it has already aged a bit. Tonight or tomorrow I'm hoping to get #51 up... and then #52 has already been recorded as well... I'd like to get caught up before going out to ETel where I'm undoubtedly going to get more recordings for special editions. Right before the holidays I had sent in to Alan Shimel a contribution for a special episode 26 of his "Still Secure After All These Years" podcast. In this episode, he asked a number of us in security field to give their thoughts on major issues of 2006 and predictions for 2007. Mine were predictably about VoIP.... but many others ran across the whole field of information security. Kudos to Alan for pulling it all together and producing the episode. Makes for interesting listening. 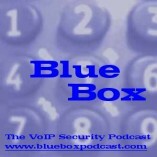 Earlier this week I uploaded Blue Box Podcast #48, where Jonathan and I go beyond just talking about the news to also review the "top VoIP security news stories of 2006" and also get into our predictions for 2007. My prediction #1 will be fairly obvious for anyone who has listened to the show for a while. We also cover the typical range of VoIP security stories, talk about OpenID for caller authentication and many more things. This was a bit frustrating of a show to post-produce. Post-production is always a somewhat lengthy process, anyway, because I want the enhanced audio that you get from a wideband codec, which means that we use Skype. However, Skype creates its own challenges with voice that will simply fade away or get garbled. It's fairly routine that we have to disconnect and reconnect a time or two within the space of the hour in which we are recording the show. (That's actually apparent in this show where Jonathan's voice is at a lower level and then suddenly is much louder. After the reconnect, he wound up with more volume.) If I could get the audio quality in a softphone without the fade outs, I'd probably drop my post-production time by a good bit. However, this week I couldn't blame Skype. I record the show in Audacity and it appears that because I had been previously editing a file located over on a USB hard drive, Audacity started writing its files for the new episode over on that hard drive. As anyone using Audacity will know, it writes a huge number of files to disk. Basically many, many little files with small pieces of audio in them. What seems to have happened is that periodically parts of the audio didn't get written. Or the files got destroyed. Or who knows what. Perhaps I had too many other apps running on the older computer I'm using for recording and Audacity couldn't keep up with what was being sent to it. Perhaps there was too much latency going to the USB hard drive. I don't know, but the end result was that there were gaps in the audio that got worse as the show went on. Just missing pieces of audio. Unfortunately, I discovered it after the holidays were already underway and I couldn't really reconnect with Jonathan to rerecord. And also unfortunately, I wasn't running a backup record as I have in the past. Given that my goal is high-quality audio production, this was a rather disappointing turn of events, but in the end I did put it out there with a big caveat in the show notes. We just recorded show #49 today and I made sure to have nothing else running on the PC, to be writing to the main hard drive and to have a backup recorder. Hopefully I'll not experience the issue again. Blue Box Podcast #47 is now available for download. In this show, Jonathan and I talk about some of the recent articles and reports hyping VoIP security, recent comments from SANS about the need for better VoIP security training, moves by the Indian government to block Skype and other VoIP services and much, much more. Tons of listener comments in this show... probably the most we've ever had. See the show notes for all the links and info. Ken Camp: "I've been Blueboxed"
Finally getting caught up on content recorded for Blue Box, I finished up on Monday night the interview I did with Ken Camp out at Internet Telephony in San Diego and posted the interview today. Ken responded with his post: "I've been Blueboxed", which gave me a laugh because I don't think I've ever seen the show name used as a verb before!